Out and About: Date Night with Studio Basic Designs is the romantic interlude in their 'get-out-and-explore' themed collection! 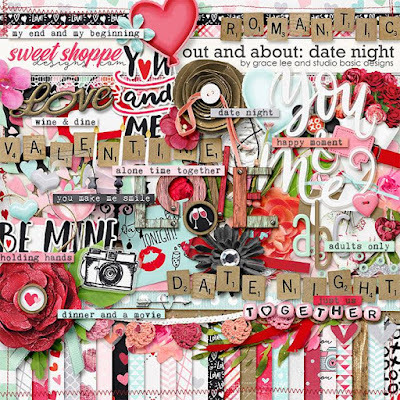 The delicious reds, pretty shades of pink and perfect patterns, combined with heart-fluttering ephemera, blooms and balloons, make 'Out and About: Date Night' your ideal choice for scrapping and journaling about those happy, precious alone moments you share with your one and only. Let 'Out and About: Date Night' get you in the mood for a little romance, as you remember and record (or perhaps plan!) your date night, Valentines celebrations, anniversaries or 'just because' moments. and 102 elements. The elements included are: 4 balloons, banner/bunting, a bouquet, 3 bows, 3 brads, 3 buttons, candlestick, a glass of wine (2 versions), 11 flowers, 2 pieces of foliage, 4 hearts, 5 ribbons, some ricrac, roses (2 versions), 2 scatters, 3 pieces of string, 2 trims, an arrow, a flowering branch, a camera (2 versions), a clothespin/peg, 4 frames, 2 heart borders, 7 labels, a leaf, a post-it (4 versions), a rosette, stitched page border, 2 tags, 2 pieces of twine, a floral wreath, stitched xoxo (2 versions), word art and titles.